Ornaments perfect for stocking stuffers! Still looking for unique gifts? These porcelain ornaments make great stocking stuffers! 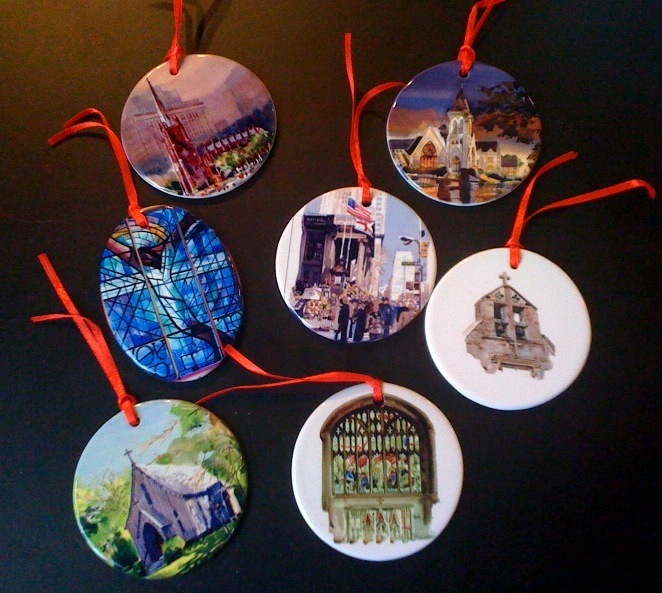 The round or oval flat porcelain pendants with watercolors of Birmingham churches, New York scenes, medieval church details, and more, can be personalized on the back with a permanent marker. They make great wedding or confirmation gifts as well. Order them along with other unique items created using Moody watercolors by clicking HERE. They ship directly from the manufacturer and include a 30-day money back guarantee if you are not completely satisfied. This entry was posted on Sunday, December 12th, 2010 at 9:02 pm	and is filed under Books and Gifts. You can follow any responses to this entry through the RSS 2.0 feed. You can leave a response, or trackback from your own site.